We awoke about an hour and a half later than we had planned, guess thats what we get for not setting an alarm, but we were ok with getting a slightly late start. 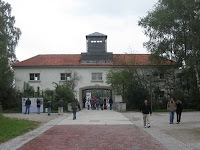 We got up and showered and headed out to the train station to see Dachau Concentration Camp. 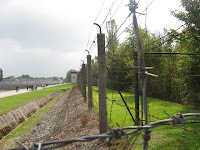 Its about a 20 minute train ride to the village and from there about a 10 minute bus ride to the concentration camp site. 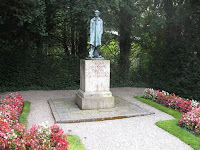 Neither of us really knew Dachau was a village as well. After misreading the bus schedule and getting off 2 stops too early, we made it to the entrance of the camp. Walking down the gravel path was almost like being in a park as it was very well maintained. Along the way there were signs depicting events that took place and what used to be along the pathway. Right before the main entrance there was a bit of the original cobblestone road leading in, and a small fragment of the original railway leading to the camp. We entered the camp through the original gate in the building that was the ss officers headquarters. 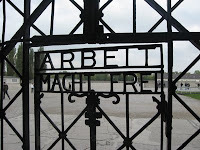 The gate door was the original one with the phrase "Arbeit Macht Frei" or Work Brings Freedom. The gate opens up to the main camp yard. 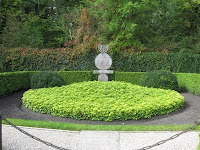 It was a HUGE yard, with all of the original buildings that surrounded it intact, although restored. 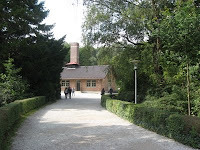 The first part of the museum was in the main building of the camp. It started off in the room where the prisoners were processed. They had a few of the original desks used, and a uniform issued to those in the camp. All through the main building there were videos, artifacts and many reader boards telling the history of the camp, events leading up to ww2, who they brought to the camp, and what went on at Dachau. Dachau was the first concentration camp the Nazi's built in 1933, and is the only camp that was used the full duration of the war. 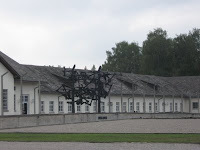 Dachau wasn't built to be an extermanation camp, but as a work camp. It's built on an old amunition plant left over from ww1. The first prisoners were responsible for tearing down what was left of that and then building up the camp that functioned from 1933 to 1945. 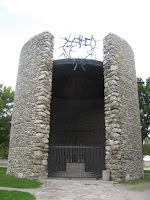 Dachau was an all mens prison up until the end of the war when the nazi's started evacuating other camps and moving them to Dachau among others. The majority of the prisoners were Jews, but it also held political prisoners, POW's, and gypsies. The other rooms in the main building consisted of the kitchen, shower room, and other processing areas. While it was great to have so much information up to read and pictures to see, it would have been nice if they had some of this building set up like it was in use, much like the way we thought the Anne Frank house should have been. Nonetheless it was a very powerful experience going through the building. In the shower room they had set up a table where they used to whip people if they did anything against the rules. The rules included things such as having a dried spot of water on the bowl you ate out of. 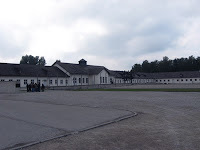 Parts of Dachau were kept spotless during the war as it was frequently used to show their camps were being kept in order and prisoners here worked to the bone to keep it that way, but outside of certain areas it was a whole other story. 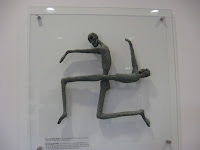 In the doctors areas experiments were carried out on prisoners. They would submerge people in freezing water to find out what organs shut down first in hypothermia or put them in a pressure room until death then see how the brain was effected by it. Just going through that room knowing what happend there is enough to make hairs stand up. Exiting the main building into the yard, we walked across to one of the bunkhouses. Inside one of the bunkhouses they had set it up to how it was during its use. 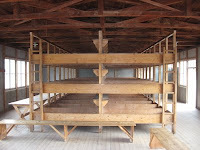 It was amazing to see rows and rows of wooden "beds" crammed into a room. The camp was set up to house 6,000 prisoners, at its peak it held over 60,000, but it usually had somewhere between 12,000 and 32,000. They say at times the prisoners would have as many as 5 or 6 in one bed. There was also one of the washrooms in place and a bathroom. We were also told that during the war the windows were chalked over so nobody could see outside. Even though the rooms had been restored some years ago, it wasn't hard to imagine the horrible living condidions. 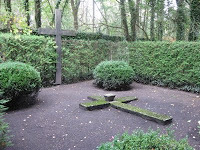 Next we walked out among the foundations of the probably 30 or so bunkhouses that weren't standing anymore, to the back of the camp where there were chapels built after the war. 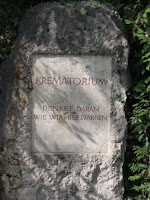 Walking a bit further into the woods we came upon the crematoriums. The first one we went in was the newer, larger one. The first room was a waiting room before the gas chamber. 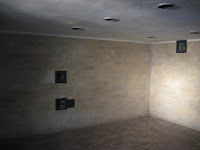 This is where the prisoners were told they were going into a shower room to keep them calm, and told to give their clothes up to the ss guards. 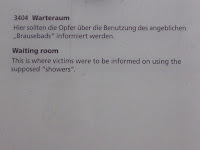 Next we went into the gas chamber room disguised as a shower. The walls of this room were over a foot thick, and there was special plumbing into the showerheads where the gas came out. The room was used to kill up to 150 people at a time in about 20 minutes. Standing in this room took an emotional tole on us both. The next room was the cremation room itself. There were four large cremators, each capable of holding three people at a time. In front of them were hooks hanging from the celing where people were hung and killed before being cremated if they were not among the ones gassed. 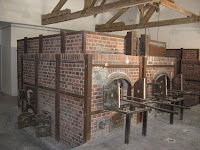 The final room was where the dead bodies were stored, waiting to be cremated. There was a picture up from when the US forces liberated the camp of the room full of bodies. We both left that building speechless and quite shaky. There really is an eery evil feeling going through that building just knowing all the unspeakable things that occured inside. Heather said she never wanted to feel or see what she felt in the room ever again. 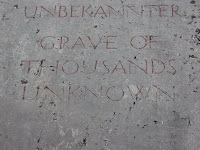 They say the numbers killed at Dachau was somewhere between 25,000 and 45,000. Nowhere near some of the extermanation camps such as Auchwitz that was rumored to have murdered between 750,000 and 1 million, but shocking nonetheless. After the liberation of the camp, the US soldiers forced the citizens of Dachau village to tour the camp, to witness the horror happening in their own backyard. Next we walked along a trail that led us by where the ashes of thousands of unknowns were buried, and to the infamous pistol range that served as an execution site as well. One time 92 russian POWs were killed at one time. This site was disturbing in its own right as they had made a drainage ditch for blood that ran out of those who were shot. After walking past a couple memorial sites, we started back towards the main building. Before leaving, we went through the prison bunker, where political prisoners were held, such as one man who tried assasonating Hitler on a visit to Munich. We both were kind of suprised to find a prison within a prison. Most of the rooms were about 8 feet by 8 feet with a small window high on the wall, and a small opening on the door. There were a couple rooms for solitary confinement in the dark. 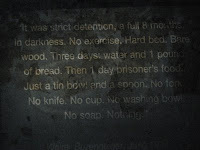 There it was said they would get water and a pound of bread to last them 3 days in the dark, with a prisoner meal every 4th day, which never amounted to much. Still, life in here was probably a bit better than in the main camp if that is possible. After that it was time to head back. Neither of us really said much for a bit as we were trying to take all of what we'd just seen in and were both pretty effected by the past few hours. We couldn't imagine what the soldiers who found and liberated this camp went through, as some of them even snapped and executed around 30 ss guards. Its really hard to imagine that not that many years ago this site was home to one of the most evil events in history, but it really ties together some of the feelings we had visiting Omaha beach. We took the train back to our hosts apartment to pack up and said our goodbyes. We will miss staying with Florian and Andreas, as we had a great time staying with them and getting to know them. We hope someday we can host them in the US. We would love to show them around the twin cities, and take them to Valleyfair, as Andreas especially is fond of rides. Before we left, Andreas had us take a shot of "schnapps", which he said is how they say goodbye. Of course we knew he was making this up, but we did anyways. We arrived just in time at the train station to catch the next train to Salzburg Austria. The Train ride was beautiful as we made our way to the mountains once again. Coming into Salzburg we caught a glimpse of the castle we want to tour, and Heather sang "the hills are alive with the sound of music" waiting for our city train to the hostel. The only directions we had to the hostel were go left up the hill out of the train stop,then make a left on the road the hostel is on. They should really change "up the hill" to climb the Bavarian Alps. It seemed like we walked a mile up the mountain, having to take a break part way up. The hostel is more a bed and breakfast really. There is a stunning view of Salzburg from atop this hill, and our room is gorgeous as well. We debated walking down the hill to explore, but thought it would be better to call it an early night and save the energy for tomorrow. After all, we do have lots of dancing in flower covered hills to do and sing our hearts out.